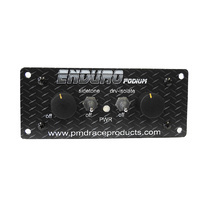 NEW FOR 2019 our Enduro PODIUM intercom ! 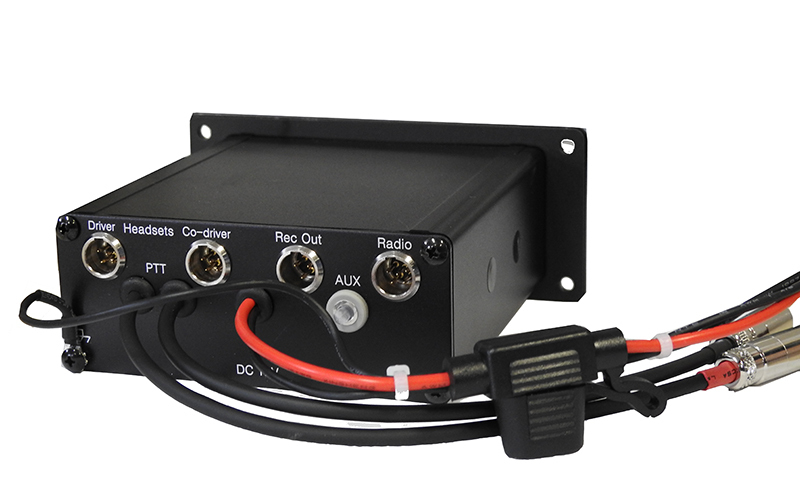 The Ideal UPGRADE or Replacement for your old tired PCI/AVCOM/RUGGED intercom unit. 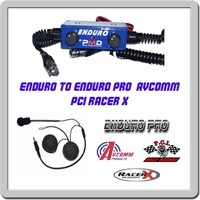 All the latest technology & features are now available the NEW PMD Race Products ENDURO PODIUM intercom. 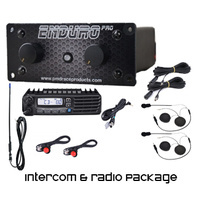 Super High powered 7 watt audio circuitry provides powerful clear communications from the NEW ENDURO PODIUM intercom. 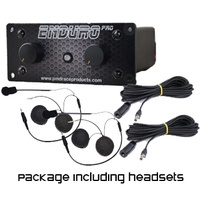 Our New Enduro Podium intercom has been designed for competitors wanting a reliable, clear intercom system with all the features needed for in-car communications. 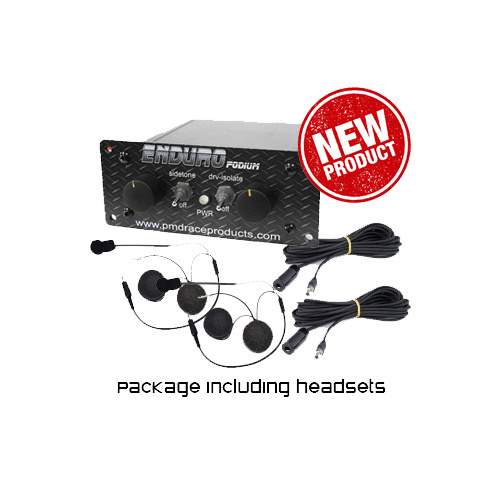 The new Enduro Podium allows driver and co-driver to select at a flick of the switch whether or not they choose to hear their own voice back thru their headsets (side tone on or off). 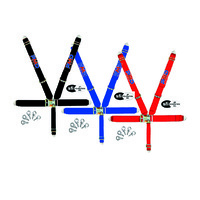 Side tone is a very useful feature that can prevent the users from yelling to get their message across. When you can hear your own voice back you are less likely to yell as you can govern how well your passenger is hearing your chatter via your own voice into your own headset speakers. 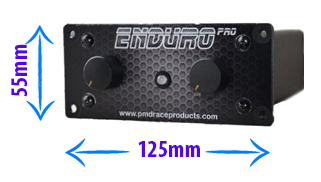 However in some cases racers like to have as less distraction as possible so simply turing the front mounted switch side tone to OFF will eliminate hearing your own voice (or side tone) and allow for quieter situations in high contrentration driving situtation. 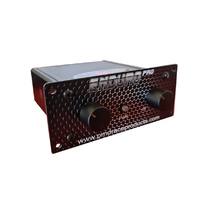 Another NEW feature is the AUX input which is wired to accept mobile phones, sat phone, GPS audio input or even MP3 audio from a music source. 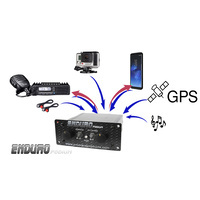 This AUX port when coupled to a smart phone can even voice command your phone and answer your phone calls while still wearing your race helmet or headset. 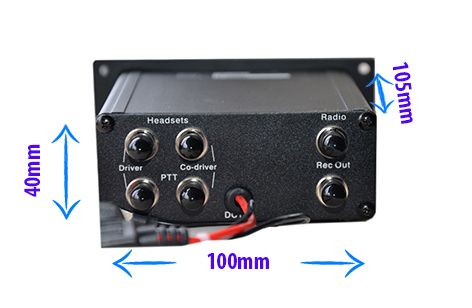 This new feature opens up a world of possiblities as we have dedicated this special AUX port and still provided SEPERATE RADIO and VIDEO audio outputs. So now you can keep adding devices to your communication systems rather then having the 'choose' what you can or cant interface to your system. 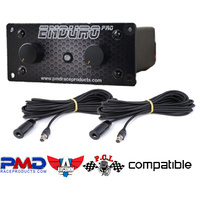 The Enduro Podium intercom interfaces easily to in-car radio radios (hand held or in-car units) and our transformer coupled circuitry with adjustable gain control ensures the communications via the race radio is high quality and at the correct audio levels. 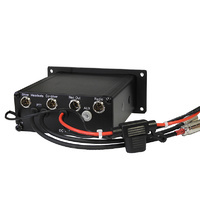 We've also added a driver isolate switch on the front panel, so again if your driver doesnt want to hear radio chatter then they can choose to 'isolate' that from their headset. The Enduro Podium also has a transformer coupled output port for feeding driver/co-driver audio directly to your on-board video system, something not found on many other opposition intercom systems. 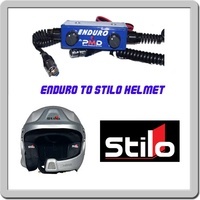 The NEW PMD Race Products Enduro Podium package also include M101 dynamic noise cancelling helmet headsets which are simple to fit to either open or full face helmets. 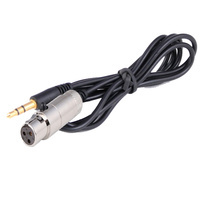 Our helmet headsets also are fitted with a high quality 3.5mm connection socket for use with optional earbuds, such as our PMD DIY moulded earbuds. One thing to point out is that some imported headsets do not secure the earbud plug well and do have a tendencay to fall out. 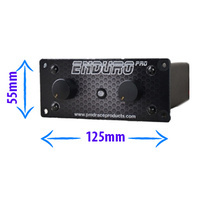 We have sourced the best possible (3.5mm METRIC) sockets to make sure our earbud sockets are compatible with all aftermarket earbudes that use a 3.5mm or 1/8" mono plug. 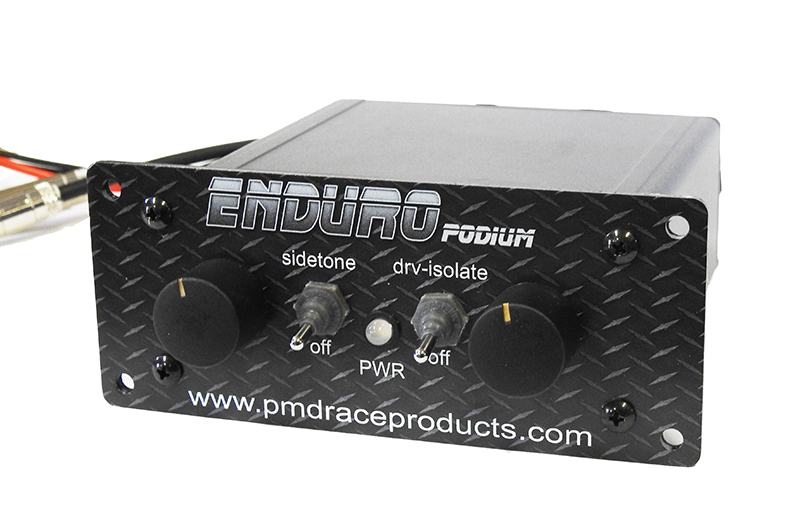 The PMD ENDURO PODIUM is also compatible with any combination of microphone (electret, dynamic amplified, non-amplified or even throat microphones) giving you flexibility for whatever your in-car intercom requirements are. 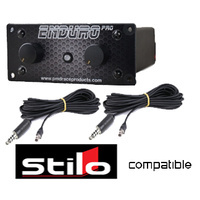 The Enduro PODIUM is also available with Avcom, PCI, Rugged,Stilo and Peltor compatiable leads so pre-wire PCI, Rugged, Stilo & Peltor helmets can plug directly into the Enduro PODIUM to provide you far superior performance over your existing Stilo or Peltor intercom amplifier for high noise and extreme racing conditions. Its the IDEAL upgrade from these other intercom units, allowing instant compatibiilty with your existing headsets but upgraded performance and features over your existing intercom systems. 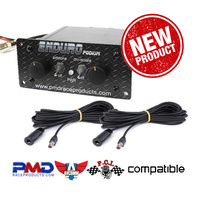 The NEW features keep on coming with the NEW PMD Race Products Enduro PODIUM, we have also included a front panel "radio transmit indicator LED" so when your race radio is in transmit mode the Enduro PODIUM front panel power LED indicator with illuminate RED instead of the usual BLUE power indicator so you can instantly tell whether you are transmitting via your onboard radio or have a radio stuck in transmit mode. We also have built our Enduro PODIUM into a rugged off road aluminum enclosure and used elastomer gaskets and O ring seals to help seal out water and grime from getting inside. Contruction of our Enduro PODIUM is now done using state of the art techniques using the latest surface mounted electronic components, making it the most vibration proof intercom ever. 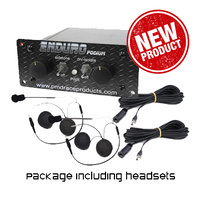 On the rear panel of the Enduro PODIUM are high grade mini TAS XLR plugs to connect the intercom to your headsets, radio interface wiring, driver and navigator press to talk (PTT) buttons and to your on-board video system. 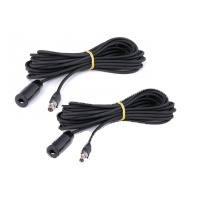 Not only do these rear connectors provide a much neater installation in your vehicle it also makes servicing and customizing your leads a lot simpler rather than having a mass of short fly leads coming out the rear of the case. 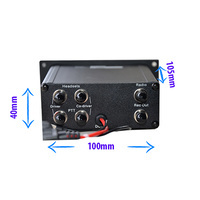 The rear panel is also clearly marked making installation and connection a simple matter of plug and play. 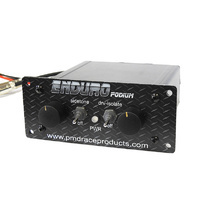 Did we mention that the Enduro PODIUM is also dash mountable ? 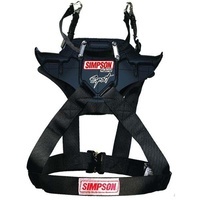 this makes for a very neat installation by simply slotting into or under your race car dash or overhead console and can sit neatly along side your onboard race radio but we now also supply "L" mounting brackets to make underdash or console mounting a breeze. 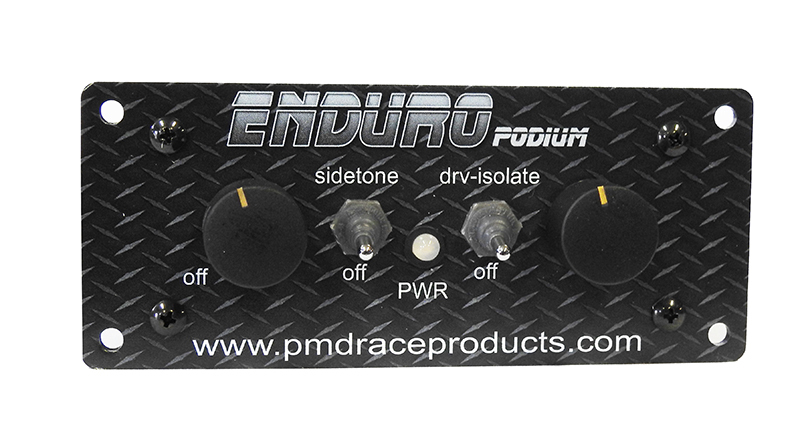 With our extensive experience in design and manufacturing of race communcation system over the past 20+ years we are proud to include all the features and design tricks we've discovered along the way with our latest Enduro PODIUM intercom system. 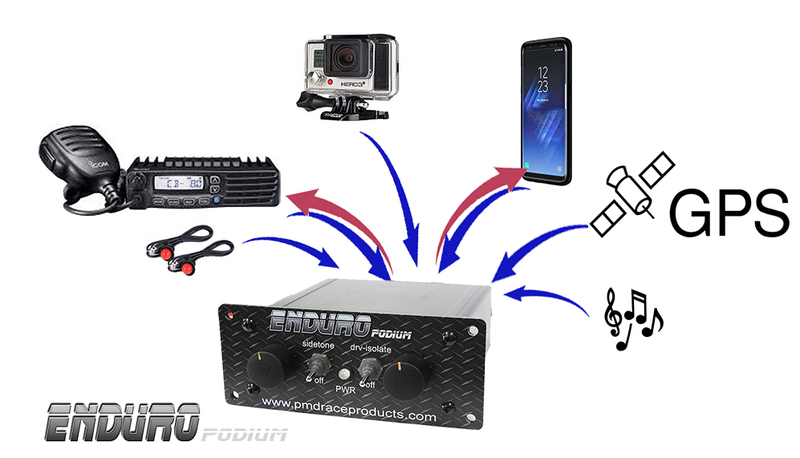 Our Enduro PODIUM provides communications for high noise environments such as off road racing, rally & power boat racing.